DC12A. Japanese "Indian" Dolls 5n 3.5"
This old set of dolls was made in Japan and represents American Indians. The red and blue dolls have mask like paint around their eyes – this looks like touch-up paint but is actually the design of these dolls. The dolls have a yellow hood / head-dress with a fan of black feathers at the back of the head, and a red dots around the face. 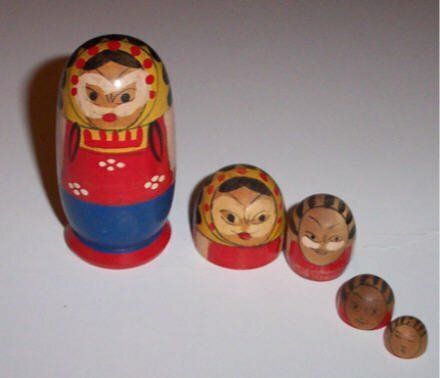 The bottom half of many of the dolls in this set is missing. The largest doll says “Made in Japan” and has four slits.